Parts of this blog post were published in 2016. This information is so important to us and to the safety of your child, we update and share it each and every year. This week many parts of the country saw record low temperatures. While it’s likely many of you stayed indoors, as we climb out of the freeze, life is going to resume to normal. It is still winter, and your kids still need to be dressed appropriately for going outside. Do you know the ONE BIG MISTAKE so many parents make both with their babies and toddlers in their car seats? I know it sounds hard to believe, but make sure there is no FLUFF AND OTHER STUFF IN THE CAR SEAT. This one simple rule can save your child’s life. It is not safe to put your baby inside their infant seat with a fluffy snowsuit OR with other blankets and accouterment which interfere with the straps of the seat itself. It is also unsafe to put an older baby, toddler or even a small child in a giant puffy snowsuit in their car seat. 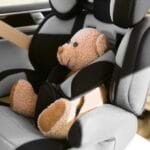 The extra stuff and fluff can in turn lead to your child not being strapped in properly or tight enough. NEW PARENTS AND OLD, THIS ADVICE IS FOR YOU! I know it seems crazy because it’s cold outside, but please do not put your baby in their infant car seat in a puffy jacket or snowsuit. 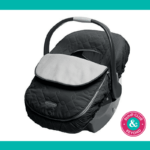 IF THERE IS ONE PRODUCT YOU NEED FOR YOUR WINTER BABY IT IS THE The Car Seat Cover from JJ Cole Collections. Save the BundleMe and other buntings for their intended use: your stroller. Depending on your stroller, many brands make their own foot muffs. Some of our favorites are the Bugaboo Footmuff ($129.95) and the UPPAbaby CozyGanoosh ($129.99). Check your stroller brand’s website for more details. For older kids, OneKid makes a car seat safety coat that is tested and approved by CPSTs. I am not a Car Passenger Safety Tech. But I have been around MANY of them throughout the eight years Bump Club and Beyond has existed, and ALL of them share this information in their seminars and on their blogs. 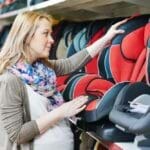 Car seat misuse is at an all-time high. Please take a minute to consider these safety tips and read your car seat manual to make sure you are using it properly. Doing so could protect your baby or child in the event of a car accident.